What on earth are you going to say about it? The title of this post is a direct quote. It is what Joanna said when she realized that I had uploaded this portrait to my WordPress media library. 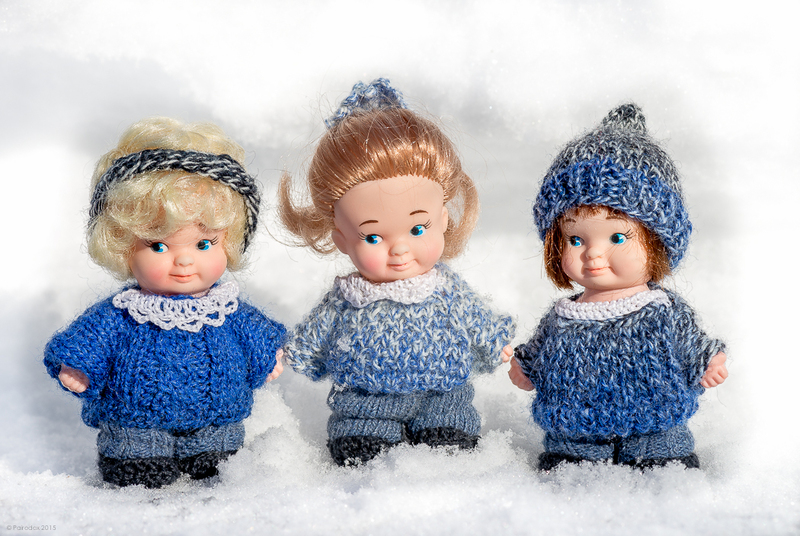 The trio is a set of Uneeda PeeWee Dolls that Joanna’s mother had unearthed from her attic. Having been returned to their owner, they arrived at the farm at a time of year when warm clothing was essential, and they had none. Joanna went to work, for it was her intention to make a gift of the dolls to a young friend of hers. She knitted (hat, headband, sweaters, and one undergarment), crocheted (hair scrunchie, collars, shoes, and one undergarment), and sewed (pants) for a week, off-and-on and around-the-edges. She asked periodically, while working on the project, Am I crazy to be doing this? Isn’t it funny that I asked the very same question of her yesterday afternoon, up to my waist in ice water, as I grabbed some photos before an advancing snow storm. My answer to her question, and hers to mine was, certainly not, for we both recognize the importance of having a creative outlet. I will be the first to admit that I have always been quick to speak the mantra … Git-r-done. I accept the charge of having applied the mandate too rigidly when the kids were growing up. I accept the charge of having applied it too rigidly to myself. As a result of this myopic focus on getting things done I don’t believe that I ever properly learned how to relax or to call time out. I had hobbies when I was a kid. But surely those were intended to keep me busy. College, graduate school and, since then, academic appointments and the farm have effectively eliminated free time. Time to be creative, and to exercise the right side of my brain (although the pop psychology of lateralization has long since been debunked, the myth persists … so we’ll simply perpetuate it here). Joanna has known all along that taking time for one’s self was important, on several levels. [Note the use of two words (one’s self) rather than one (oneself).] I have been blind to her example. Until recently. As I am now firmly established in what we euphemistically refer to as mid-life, I have come to realize and to appreciate the value of stepping back from work and of doing things that are good for the soul. Although I realize the importance and value of this, I’m not yet very good at it yet. But, practice makes perfect.